This special supper is easy to assemble. All you need is a small stove to cook the pasta. If you don't have a barbecue for the steak and aubergine, fry the aubergine on the stove first, then cook the pasta and dress, then quickly fry the steaks while the pasta stands. Cooking times for the steak will vary, but as a guide allow about 4-5 minutes per side for a medium steak. Rub the steaks with salt and freshly ground black pepper and a sprinkling of oregano. Cook the pasta in plenty of boiling water for 7-8 minutes until tender. Meanwhile, brush the aubergine slices with a little olive oil and cook for 3-4 minutes on each side until lightly browned and tender. Transfer to a plate and cover with foil. Fry or barbecue the steaks for 4-5 minutes on each side. Cover and keep warm. Drain the pasta and return to the pan. Stir in the dip and rocket, then season. 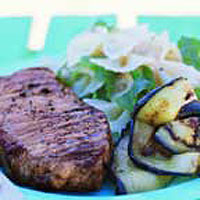 Turn onto plates and top with the steaks and aubergine slices. Serve immediately.